* Board is sensitive, but you can still cheat at exercises. Wii Fit takes the whole concept of games as exercise to a new level with the inclusion of a balance board peripheral that can tell you on the fly exactly how well--or how poorly--you're doing with its various activities. As such, Nintendo is heavily marketing this innovative title as a mixture of fitness and fun, and for the most part it works. It's a decent alternative for those bored with the repetitiveness of going to a gym or too self-conscious to join a yoga or aerobics class. Unfortunately, Wii Fit is hamstrung by some odd omissions (such as not being able to create your own program from the available exercises) and questionable health advice, limiting its effectiveness both as a fitness tool and as a game. At the core of the Wii Fit experience is the new balance board, an elegant-looking yet surprisingly sturdy peripheral which features several internal scales that can detect changes in weight and pressure as you're standing on it. The board--which is also quite hefty at roughly 8.8 lbs (4kgs)--interacts wirelessly with the Wii, and takes four AA batteries (which are included). The board has four rubber feet to help prevent it from slipping on smooth surfaces (and even comes with four extra feet that can be used to raise your balance board higher should you have thick carpet on your floors). Like the Wii Remote before it, the balance board is intuitive to use once you get into an exercise or game in Wii Fit, with its extreme sensitivity allowing it to pick up even the most minute shifts in weight. Its sensitivity only goes so far, however, with the board able to take only 330lbs (150kg) maximum weight, locking out the particularly robust from joining in on the Wii Fit fad. Not that plus sizes need worry that they're missing out on a prime weight-loss opportunity. Despite its moniker, Wii Fit isn't a total fitness solution, with its included exercises focusing more on improving muscle tone and balance than on cardio and weight loss. What it does offer is a better way to track your weight, body mass index (BMI), and time spent exercising both within the game itself and from any other external activities, giving users a clearer picture of how their health is progressing over time. It's no more going to make you super-fit than Wii Sports is going to make you a tennis pro, but it can provide a strong anchor for a more expansive fitness regime should you have the motivation. As a title focused on health, Wii Fit makes some fairly significant judgments about its users' fitness. This happens right from when your Mii is first registered with the game; after inputting a date of birth and height, you're asked to step on the balance board for a weigh-in (all guided onscreen by a cartoon version of the board). From the height and weight data, a user's BMI is calculated, with the user tagged as underweight, ideal, or overweight depending on the BMI score. A simple balance test then occurs (usually involving having to shift your balance to certain areas within a time limit) before your Wii Fit Age is displayed in large numbers on the screen. Only one Wii Fit Age result can be recorded daily, although you can practice the variety of balance tests as many times as you want. It's here where Wii Fit could possibly become problematic for some. Judgments such as BMI and fitness levels usually come from doctors and health care professionals, not cartoon versions of a computer game peripheral--and Wii Fit frankly doesn't do a good enough job of explaining the science behind its measurements. 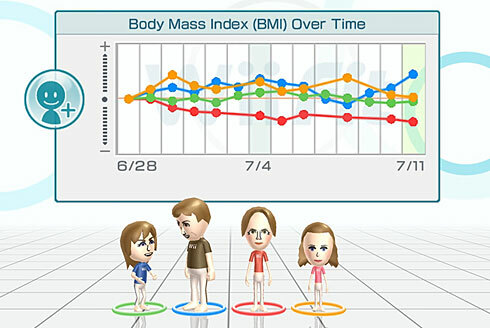 While BMI, for example, is a well-established tool for measuring a person's ideal weight, Wii Fit fails to make players aware that variables such as muscle mass and age can significantly affect a score (giving an otherwise healthy person with more muscle an overweight rating, for example). The title also throws the term "metabolic syndrome" around quite often, stating people with poor balance and low health can suffer from it without ever explaining what it actually is. Although most users of Wii Fit will probably not take the game's BMI or fitness age calls too seriously, but there's bound to be some overanxious player who does. In structure, Wii Fit is most reminiscent of the various Brain Training games on the Nintendo DS, with the title broken down into a series of exercises that players can do regularly to improve their health. These exercises are split into four different categories: yoga, muscle, aerobic, and balance. The yoga and muscle categories feel the most like traditional exercise, with 15 yoga poses and 15 muscle-toning moves to work through. Yoga poses range from the absurdly simple (standing still and breathing--yep, that's all) to the quite difficult and possibly lawsuit-in-the-making shoulder stand. It's a similar situation with the muscle-toning section, with basic lunges mixed in with more strenuous activities such as the parallel stretch and push-ups. Virtual trainers (you can choose from either male or female) guide you through the yoga and muscle exercises, offering praise or criticism depending on how well you're doing. The aerobic and balance activities represent the fun side of Wii Fit with 18 games to choose from. The aerobic games include hula hoops, Wii Sports-like boxing, step dancing, jogging, and more. The balance activities are what most casual users of Wii Fit will first gravitate to, and include ski jump, ski slalom, snowboarding (where you have to turn the balance board sideways), a table tilt game where you have to use your shifting weight in a Mercury Meltdown-style challenge, and more. You'll be anchored to the balance board for most of these exercises and activities, with the board giving you on-the-fly feedback on just how well you're performing. Each activity features an onscreen indicator showing you where your weight should ideally be placed, with Wii Fit assigning you a score based on how well you've managed to keep your balance or shift your weight to the appropriate areas. In this, the board is a remarkable piece of tech, with even the slightest quiver of your feet registering as a shift in balance. But while the board is extremely sensitive when it comes to weight, it can't actually track what you're doing with your upper body. This means you can easily "cheat" your way through most of the exercises by simply shifting your weight to where Wii Fit indicates it should be. It's even easier to cheat in the few activities where you don't use the board at all. In jogging, you're supposed to either tuck the Wii Remote into a pocket or hold it in your hand while running on the spot, but you can achieve the same effect by simply waggling the Wii Remote. But as with any form of exercise, you won't get real results by cheating. Wii Fit's list of yoga and muscle exercises do have the potential to tone muscles and improve balance with regular use, although with only 30 moves in total, it'll get old rather quickly. It's puzzling, then, that Wii Fit initially locks most of the exercises, with time spent using the title the only way to unlock them. New activities are unlocked roughly every 10 minutes of use, which means you'll need five or six hours of Wii Fit play time before you get full access to all of its activities. And any unlocked activity can only be played with the profile that gains it. That means if you have several people registered on the one console, all of them would have to unlock the activities individually. What's even more baffling is the lack of an option for players to create their own workout programs by stringing exercises together. That means you can't choose, let's say, four yoga, three muscle, and two aerobic exercises to create a tailored half-hour program. Instead, you'll have to select an activity using the Wii Remote, perform it, jump back into the main menu, select another activity, and so on. It's jarring, and certainly not the smooth workout experience many were probably expecting from Wii Fit. This strange lack of functionality extends to the "fun" parts of Wii Fit--the aerobic and balance games. There are scant few multiplayer options in this title, meaning players can't directly take on family and friends in any of the games (two-player jogging being an exception). Considering Nintendo's strong social push with the Wii, this is a strange move. Thankfully, most of the games are quick affairs, although it's still annoying to have to kick all the way out to Wii Fit's main menu to select another Mii to play with. Some of the games themselves are rather shallow, too, and will fail to excite most people after a couple of weeks. Perhaps the best game of the bunch is the table tilt game, which becomes increasingly difficult and can really push your balance control. Wii Fit's presentation is typical Nintendo, which is to say that it's clean and cheery for the most part. The title looks best with its aerobic and balance games, with a player's assortment of Miis taking centre stage. The character models used for the fitness trainers are rather low-definition, however, and are functional rather than impressive. In-exercise audio is also bland in an elevator-music type of way, although thankfully it's not the thumping dance music you hear blaring out of most gyms. Online is nonexistent here, but the game does feature a Wii Fit Channel function which allows you to check your progress and compare it to other Miis on your Wii without having to start up the full game. Wii Fit's included exercises do have the potential to positively impact your health, but thanks to its lack of exercise options, poor support for multiplayer, and shallow health advice, this title isn't a gaming fitness revolution. What it does do is serve as a great introduction to the very impressive balance board, a peripheral which is already being lined up for use in other games. But for a game that's being marketed so heavily on fitness and fun, Wii Fit is a little underweight in both.